You thought model railway enthusiasts were strange. How about this from the BBC News web site? Money. Property. Land. Heirlooms. Whatever the mourners were hoping to inherit when they first gathered for the reading of the will, they were to be sorely disappointed. Shock. Disbelief. Dismay. Indignation. That’s what they got instead. The man they grieved, who had never given them so much as a penny while he breathed, stayed true to the habit of his lifetime. He’d left everything – the whole kit and caboodle – to his killer. It wasn’t a ghastly coincidence, nor the tell-tale sign of murderous greed, but a heartfelt gesture of thanks – appreciation for a job well done. Mr Railing had had a premonition, an unshakeable sense that he was going to die before his time. Not just that, he was tormented by the idea the end would be violent. Rather than sit and wait for the Grim Reaper, he decided to actively seek him out. And the most agreeable way of finding him, in that calamity-punctuated age, was to catch the train. Repeatedly. So that’s what he did, according to the reports in the Victorian press. Mr Railing headed this way and that in Britain and the continent, fervently hoping the next arrival at each platform he set foot upon would be the express service to oblivion. 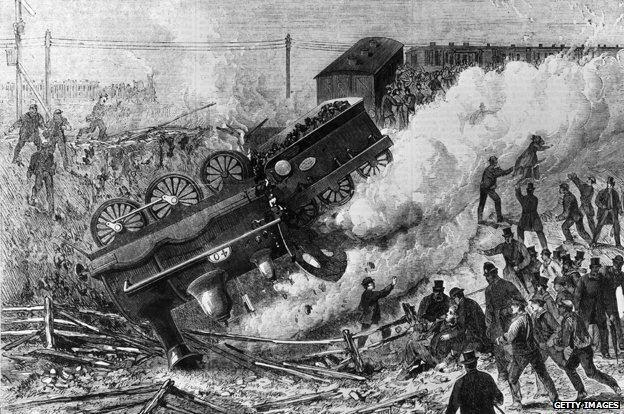 Discouraged by these frustrating shortcomings of British and European railways, he made for America, which had developed a promising line in lethal mishaps too. A disheartened Mr Railing – who was either aptly named or a gin-soaked journalistic flight of fancy – came back home. And it was here, somewhere in the south of England, on an unspecified date, where he finally got his wish. He was crushed under a railway carriage. After the funeral, his will was opened, along with a can of worms. “I give and bequeath all my goods, present or future, moveable or immovable, to that railroad company on whose road I have had the happiness to meet with death, that blessed deliverance from my terrestrial prison,” his ashen-faced relatives heard. And here’s another one to watch. An epic journey across Mexico. And how about a model of their critter? This entry was posted in Prototype, Weird and wonderful and tagged prototype, railway. Bookmark the permalink.